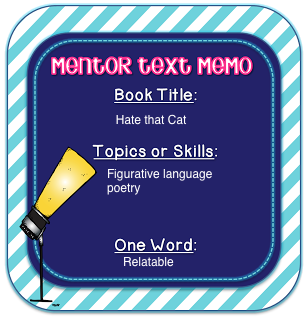 I am linking up with Collaboration Cuties to share an ELA text that I absolutely love! 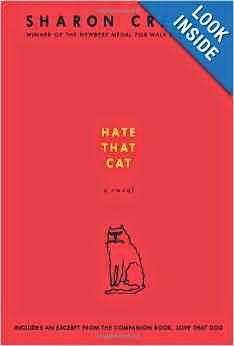 In honor of April being poetry month I am linking up with one of my favorite poetry stories, Hate that Cat by Sharon Creech. So many of my students hear the word poetry and cringe. It's absurd! They don't even KNOW poetry. They just assume they don't like it. This poetry book is adorable! It reads like a story and even talks about the frustrations about poetry within it! Just as I expose my students to different genres of literature I also expose them to different types of poetry. I have so many copies of this book. I purchased them through the dollar deals at Scholastic. I love the dollar deals! I have gotten so many great books through them. I give all of my students a copy to borrow and a packet full of comprehension questions. These questions that accompany the story discuss literary elements, poetry analysis, comprehension, and poetry types. I like to allow my students to work on this at their own pace. We discuss the story and do a lot of classwork on poetry (elements and creating our own). 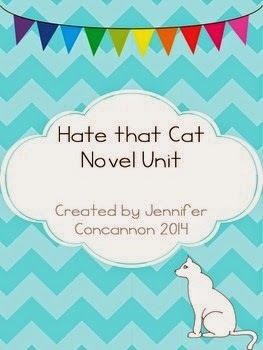 Click on the picture below to be taken to my unit for Hate that Cat. There are many other poetry products I have for sale as well so be sure to check it out! I just heard about this book! I've seen the dog one but I must get both of these for next year! I'm so glad you linked up! Definitely check it out! These books are great. I love your blog and ideas...I will definitely link up again!